Trophies2Go winner of “Best People to Work With” Award! This entry was posted on June 4, 2013 by Jessica Anderson. Last week, MeritShare announced 6 winners of its “Best People to Work With” award! The awards were given to companies who demonstrate high levels of employee participation in peer-to-peer recognition. We were selected from over 400 companies that use the MeritShare recognition software. "Top talent attracts top talent -- and the best candidates are drawn to companies with people who work well together," said Travis Pearl, co-founder of MeritShare, "We established this award to honor companies that demonstrate a high degree of team cooperation and positive communication expressed through a peer-based recognition program." At Trophies2Go, meaningful recognition is not only for our customers, but also for our employees. We are extremely honored to receive this award. 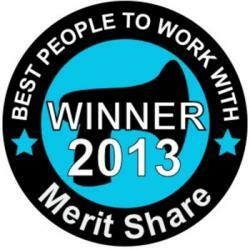 To find out more about MeritShare and the “Best People to Work With” award, check out the press release.